It was a ridiculous attempt I should say and a wasted effort. This was my first time visiting Mount Seorak and the idea was to go with my brother; Am, my distant uncle; Adi and Ayu; no more introduction needed...hehe. 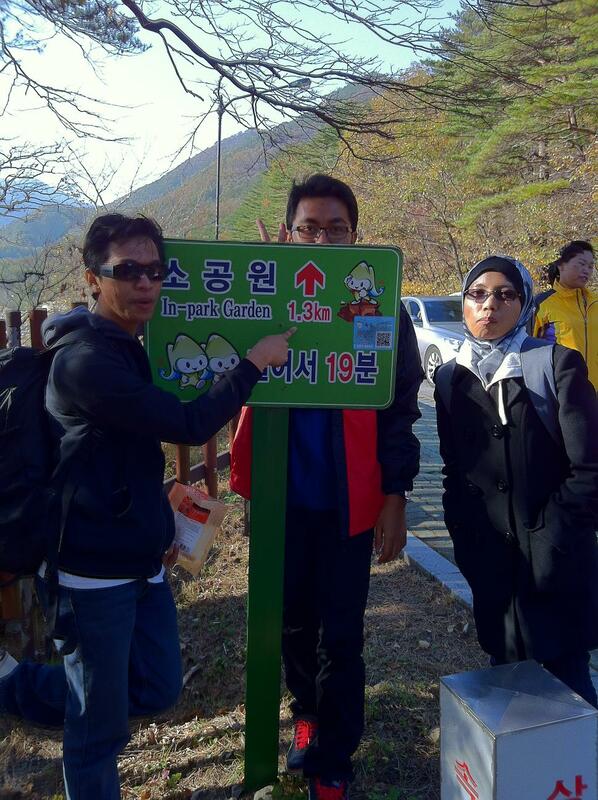 Not to hike but just to check out the possibility of one day trip to Mount Seorak. I should say that; Am, Adi and Ayu were my guinea pigs to experiment this crazy attempt. They are my Charlie "A"ngels = triple A..ahahaha..
Breakfast at DongSeoul Bus Terminal. It would be best if I spend a day or night at Sokcho area and then hike my way up to Mount Seorak instead of going up with cable car during peak autumn. If you are a mountain hiking lover; Mount Seorak would be a great choice. The idea of taking a cable car to appreciate the awesomeness of Mount Seorak is unthinkable. I mean..when the express bus that we rode passed by parts of Mount Seorak; OMG..look at the view!! It was superbly awesome, what more if you hike her! You should DEFINITELY hike Mount Seorak. No question asked. How to go to Mount Seorak? 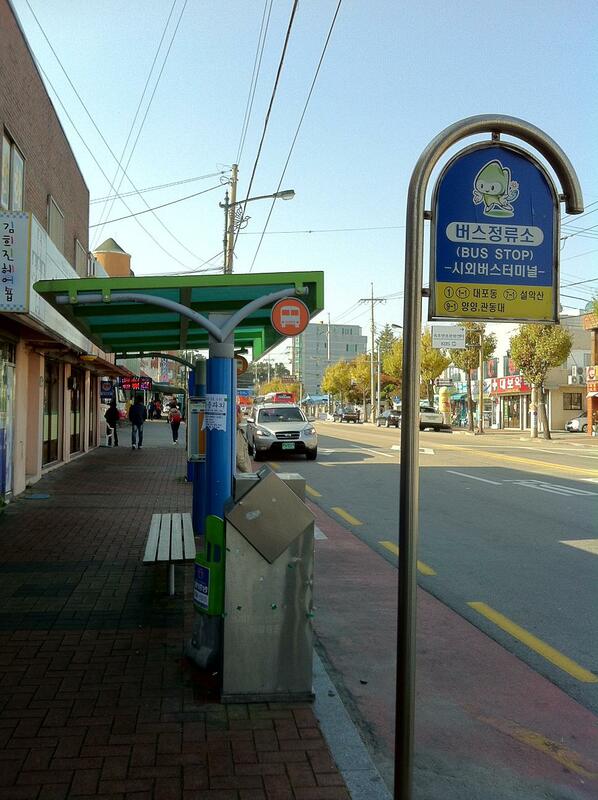 First, go to Dong Seoul bus terminal which is located near Gangbyeon Subway Station, Line 2, Green. You won't miss the terminal cause it's just next to the subway station. Go to any counter and asked for Sokcho. (속초). The ticket and the bus platforms - number 4 or 5. I took the earliest subway train to Gangbyeon Station and got a 9.06am bus to Sokcho. The bus company promised a journey of 2 hours and 10 minutes..nope..it took us 3 hours to reach Sokcho. 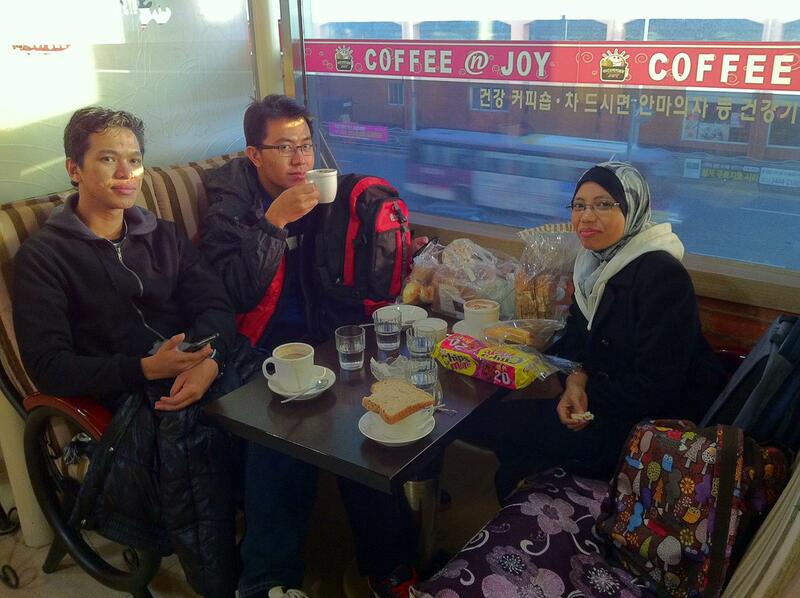 We had so much time to kill about 1 hour and a half actually and had our breakfast at the terminal courtesy of Ayu. 고마워! 4 people in black..^^ in front of the restaurant in Sokcho. Ahh..we met Khairul, another Malaysian who travelled on his own!! Superb!! After lunch, we just walked around the pier looking at the fishermen working their as* off ..huhu. The Abai village; where Autumn In My Heart Korean drama was shot was just around the corner but we had limited time as we had to rush for Mount Seorak. We walked back to the Sokcho bus terminal and waited for local bus 7-1 (1,100 won per ride) at the bus stop located about 2-3 metres away from the terminal. 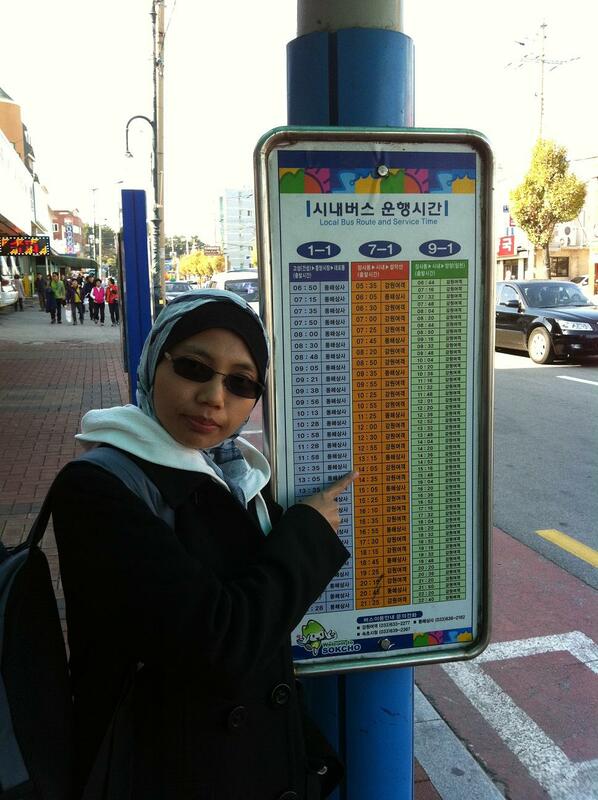 The 7-1 bus schedule to Mount Seorak. The local bus ride was around 30 minutes and Mount Seorak was the last destination. But....... we couldn't get to our last stop. Because...they were so many people coming to watch the autumn foliage so we had to walk about 1.3km to the main gate!! 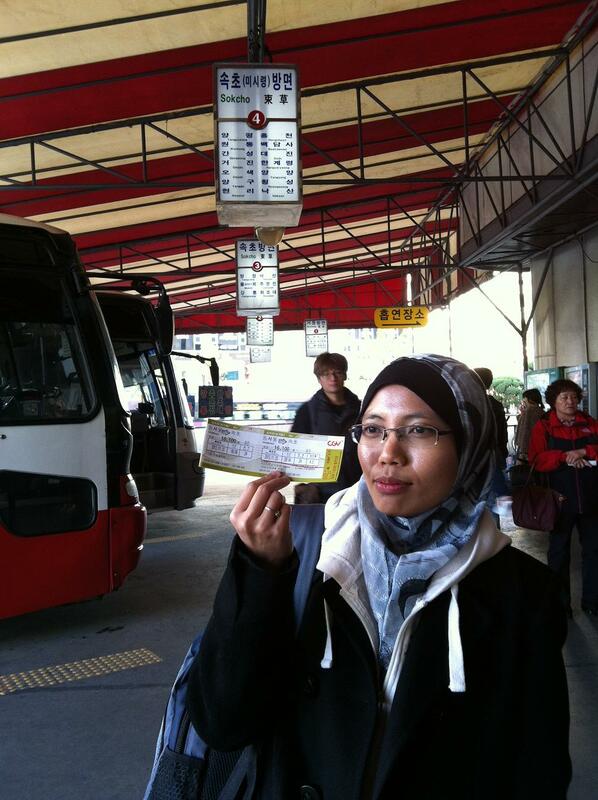 Cable car ticket was sold out!! Anyway, because the day time is shorter in autumn, we just had a small picnic near the river and then took a taxi back to Sokcho bus terminal for about 13,000 won. 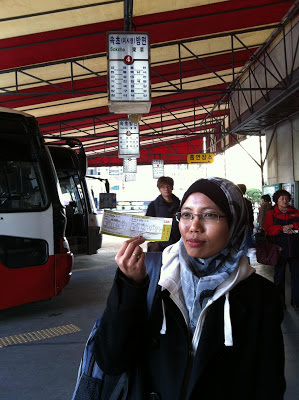 The time was 6.18pm and we reached DongSeoul bus terminal at about 9.00pm. My verdict: If I ever go again to Mount Seorak..I would definitely stay a night there or around Sokcho. Note: If you manage to ride the cable car at Mount Seorak, add another 9,000 won. 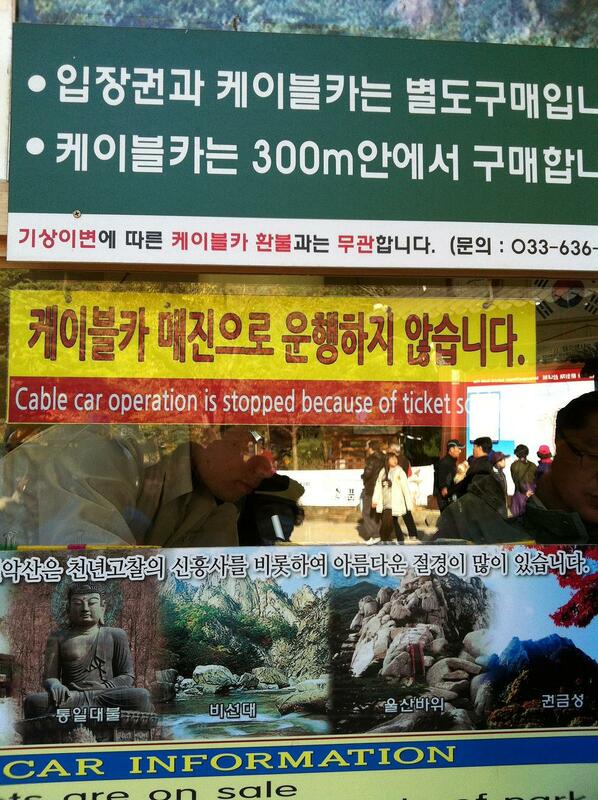 More information from KNTO: Cable car and Mount Seorak.